Cirque capacitive touch technology provides flexible, clear, robust, secure touch input solutions. Power2B provides innovative 2D and 3D sensing solutions for mobile devices, computers, and many other applications. Touch International, a leading provider of high-quality touchs screens and touch screen components. 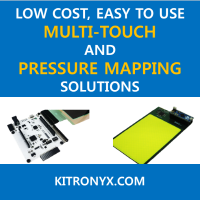 Supplier of touch screens manufactured for OEM's, Systems Integrators, and Value Added Resellers.